Houston’s Restaurant has one of my favorite tasting waters ever. Not only is it ice cold, but their water tastes incredible pure and clean. The last time I was there, my friend and I finally asked them if they did anything special to their water to explain how great it tasted. The answer was that their water went through UV filtration system. Intrigued, I decided to look into what it would take to bring this awesome water to the comfort of my own home. 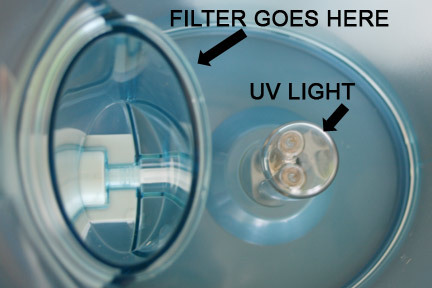 The answer (at the time) was to install a UV filter under the sink costing anywhere from $1100 to $6000. Ouch. It looked like my efforts to get UV purified water were out the door… until Homedics introduced their new Restore water purification pitcher. 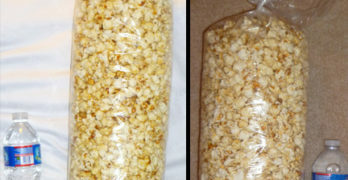 The Restore system consists of two steps. The first purification step the water goes through is the the carbon filter, which helps reduce heavy metals, the taste and smell of chlorine, and some other pollutants that can be found in the water. Now I can guess what you’re thinking, so far, other than that big cord thing on the left, it looks and sounds like it’s just another pitcher. But if you recall, I said that there were two stages for this water purification system. 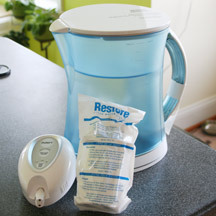 The second step is what really differentiates Restore from other water pitchers and that is the UV Clean technology it uses to take clean water to a whole other level. Here’s a shot of the inside of the pitcher. 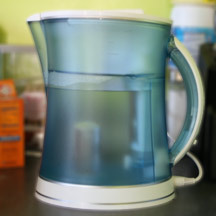 Setting up the pitcher was easy – typical of other water pitchers. You have to soak the carbon filter in water for about 10-15 minutes before using it. The pitcher holds about eight cups of water with the filling reservoir holding 4 cups, so you need to fill it twice to get a full pitcher. In order to turn on the UV lamp, you will have to flip a small lever on the handle from “Fill” to “Purify.” This essentially closes off the fill reservoir, keeping you un-UV treated water separate from your UV purified water. Next, plug the adapter into a wall outlet and to the pitcher. The adapter acts as the “brains” of the pitcher. It won’t turn on the lamp unless the lever is on “Purify” and the lid is firmly shut. The adapter will also notify you when it’s time to change your filter based on the number of cups per day setting you use. After everything is plugged in and closed correctly, hit the “Purify” button and the UV lamp goes to work. After the lamp goes off, it’s time to pour yourself a glass of some freshly purified water. It’s been my experience that not all water tastes alike. My friends use another water filter and there have been times that I felt like the water was laden with something….metal, bacteria, I don’t even know what. It just didn’t taste clean and fresh. I’ve been drinking filtered water from my fridge because I loved that it was so cold, and I thought that one tasted fine. But when I do a side by side comparison between my filtered refrigerator water and water that has been through the Restore Clean Water Purification System, I definitely notice a difference. 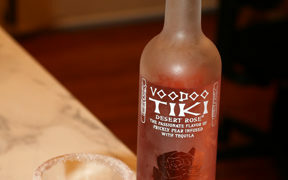 The major difference is in the aftertaste. The fridge filtered water has a metal aftertaste to it while the Restore water has none. 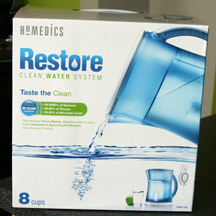 I felt that the Restore water had a much purer taste than other waters that I’ve had. Now I don’t have a science lab in my basement (I don’t even have a basement!) so I can test for bacterial, virus, and microbial cyst content. However third party testing seem to support the Homedics Restore purification statements. The Homedics Restore Clean Water System takes water purification to a whole new level, offering greater peace of mind that you are drinking clean and safe water. Homedics Restore is currently on sale on Amazon.com for $54.72. 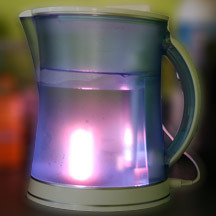 While this isn’t the cheapest water pitcher on the market, it is the only one I found that offers the extra UV purification step. For more information about the Homedics Restore, please visit www.homedics.com. Here’s a quick video that also explains the benefits of Homedics Restore. Disclaimer: This post consists of my (and/or fellow tester) opinions only. No compensation was given for this review/giveaway. I did receive a free Homedics Restore from the manufacturer or representing PR agency to use and test for the purposes of this review. This did not affect the outcome of this review. Also, I am not a medical or health care professional. 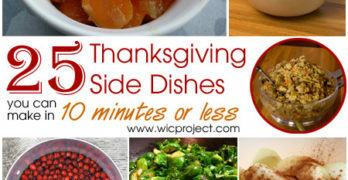 All statements made in this post are my experiences only and I make no guarantee for how this product will work for you. Please verify any claims made by the manufacturer directly with them.